Property Location With a stay at Khaosan Tokyo Laboratory in Tokyo (Asakusa), you&apos;ll be minutes from Nakamise Arcade and close to Sensoji Temple. 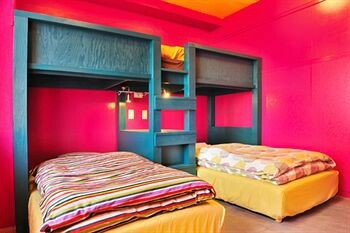 This hostel is close to Tokyo Sky Tree and Tokyo Imperial Palace.Rooms Stay in one of 16 guestrooms featuring LED televisions. Prepare your meals in the shared/communal kitchen. Complimentary wireless Internet access is available to keep you connected. Bathrooms have showers and complimentary toiletries.Rec, Spa, Premium Amenities Make use of convenient amenities, which include complimentary wireless Internet access and tour/ticket assistance.Business, Other Amenities Featured amenities include a computer station, multilingual staff, and luggage storage.